I’m starting to find my way through the Fort Collins arts scene, and I believe that CSU’s School of Music, Theatre and Dance will be a regular part of my theatre diet. 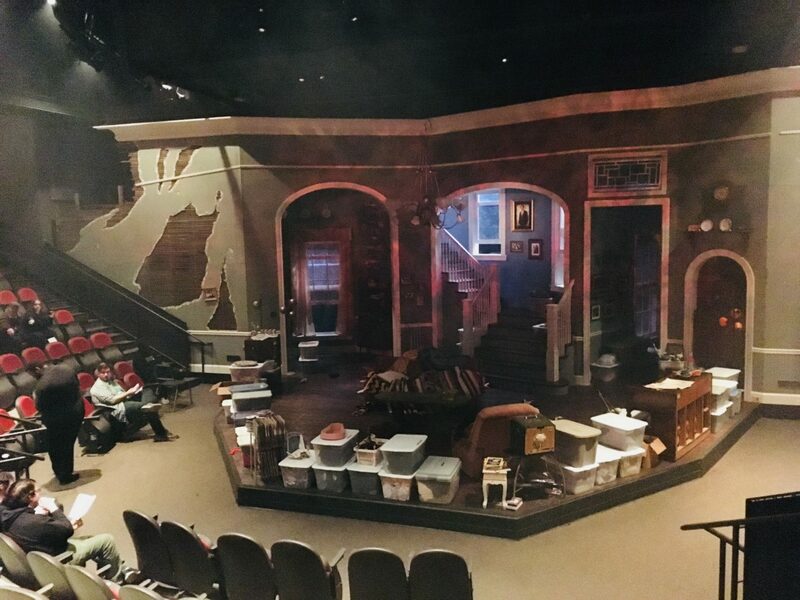 Last week Dan and I were able to take in CSU’s production of “Appropriate” by Branden Jacobs-Jenkins. “Appropriate” is a story of a family in shambles following the death of its patriarch. Questions about the late father’s past keep the Lafayette family at arm’s length from one another, with arguments and disagreements simmering at all times. The bulk of CSU’s “Appropriate” impressed me, starting with an incredibly nuanced lighting design by Joshua H. Legate. Go figure: the week that I have an upper respiratory infection coincides with a production requiring a zealous use of fog machines, not once but in at least three separate instances. However, the effect was easy to forgive as it created a beautiful, haunting atmosphere and supported a dramatic opening scene lit by flashlight. Legate also makes magic with candles, cell phone glow, a thunderstorm, and an antique chandelier complete with mismatched bulbs. Chandler Oppenheimer’s clean sound design paired nicely throughout. The set design (Roger Hanna and Abby Jordan) of the vast Arkansas plantation also knocks it completely out of the park, spanning four fully realized rooms and suggesting a few more. The space is lived-in, believable, right down to the functioning crawl space and the registers mounted on the walls. The space is not complete without the constant drone of cicadas (Oppenheimer) and the shabby furniture (Hanna, Jordan). It all works together. Speaking of working together, the ensemble is strong, and grows stronger over the three-hour production they must push through. I noticed a lot of listening — Jacobs-Jenkins’ script is replete with revelations and the cast could be counted on to react as though hearing them for the first time. The character of River feels like a caricature — the hippie-dippy girlfriend who whips up “quinwaffles” and wears lots of turquoise and fringe — but Cierra Amavisca plays River with a breathy naiveté that adds some depth. Sonny Walls is Toni, the put-upon eldest sibling in the Lafayette clan; Walls musters maturity beyond her years. Ben Johnson is angsty and uncertain as Toni’s teen son Rhys. Ryan Volkert is a bit of a weak link as prodigal son Frank, home to make amends after a decade of freewheeling. Direction by Garrett Ayers (assisted by Richard Keesling, Kaya Rudolph) keeps the family moving around the plantation at a claustrophobic pace — no one can find personal space, building toward a no-holds-barred scene that I won’t spoil other than to point out there is a fight choreographer on the bill (Benaiah Anderson). The “Appropriate” experience is a lot to take in, especially with the constant tension being served up. (Another difference in a university production: a much younger audience. Refreshing at times, though the room tended to titter and snicker at difficult moments intended to carry more weight.) There are a few false endings, and a handful of quick final scenes admittedly left me perplexed — their visual design remains gorgeous as the plantation deteriorates, but I missed their larger meaning. These facts don’t spoil the overall “Appropriate” experience, which left me hungry to see what CSU’s theatre department will offer up next.